Play It Again Sports Winnipeg – New Jets Shipment! | Professional Use Only, No Warranty. 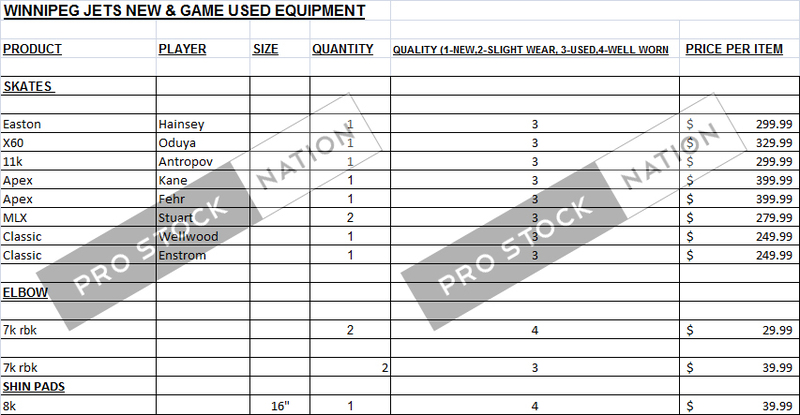 This entry was posted on February 17, 2012 at 8:01 am and is filed under Equipment Sales with tags Alexander Burmistrov, APX, Bauer, CCM, Chris Thorbutn, Classic, Easton, Elbow Pads, Eric Fehr, Evander Kane, Game Used, Gloves, Goalie, Johnny Oduya, Kyle Wellwood, MLX, Nik Antropov, Pant Girdle, Play It Again Sports Winnipeg, Pro Return, Pro Stock, RBK 7K, RBK 8K, Reebok, Ron Hainsey, Shin Pads, Skates, Sticks, Tanner Glass, Tobias Enstrom, Total ONE, Vapor, Warrior Shoulder Pads, Winnipeg Jets, X60, Zach Bogosian. You can follow any responses to this entry through the RSS 2.0 feed. You can leave a response, or trackback from your own site.